I call Harley my expensive rescue because while I thought I was working with a authentic, trustworthy, honest breeder, it was in fact a well disguised puppy mill. A breeder has told you that the pups parents are AKC registered and they come from a line of champions. If you assume that this ensures they are healthy – you’d be wrong. I assumed and I was wrong! A clean bill of health took months not to mention the additional dollars for vet visits. At the time I thought I had done my due diligence. I now know I didn’t know what I was looking for. And this happens all too often. what is the breeders home like? what is their spay/neuter policy? When we were ready to bring a second Doodle into our lives, I was better prepared. I knew the questions and I paid attention to the answers. It made the world of difference. Thanks Monika – In some sort of crazy way, I’ve always felt that this is why I drove all the way to Penn to get a Doodle (so many breeders in VA) because I was supposed to save Harley. Hi Duncan, Happy to hear that. Come back again soon. Have a great week! Bailie and I are both from good breeders. There is nothing wrong with getting a pup from a good breeder. Jax’s breeder even has a touch of doodle hair! Now that is dedication! I agree. I am so happy Harley’s breeder is finally out of commission. He was a horrible person and did horrible things to helpless animals. I’m glad Harley ended up with me! ive considered doodles. we have a rescued bichon poodle mix but when the time comes to get another dog I will check back with your wise advice. Thank you Pam – Please visit IDOG (International Doodle Owners Group) – they are a wonderful doodle rescue group whom I consider the true experts. Thanks so much for stopping by, come back again soon! Thank you for this post, I’m sorry Harley came from not so nice conditions and sick, I’m glad he found you thou. There are some not so trustworthy people out there. I’m glad to be one of the good guys. I’ve never worked with a breeder, but I know several reputable breeder in our area and I know who to call when I’m ready. Two things I learned about breeders is that they don’t advertise on Craigslist and they will allow you to visit their home. When we were looking for a puppy, one guy would only meet us in a parking lot. RED FLAG. Because of that experience, I ask for referrals. Referrals are excellent, and with some breeds there are AKC lists of reputable breeders that allow state and local inspections, etc… For us, right now, there is no such thing for the hybrid world, so we do exactly what you did. 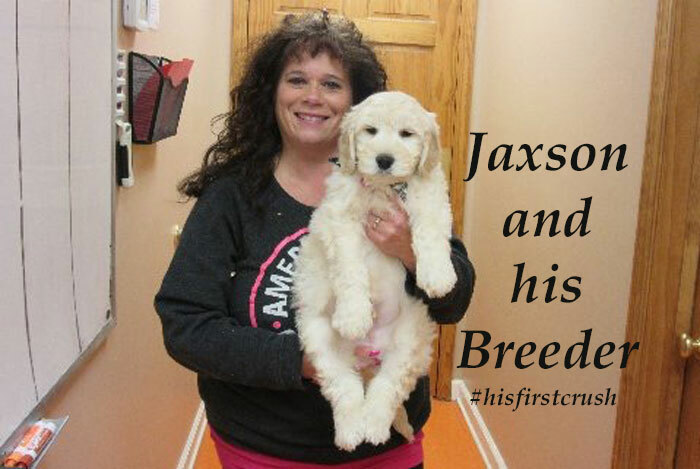 Leo and Jaxson’s breeder (the same) are a husband and wife veterinarian team – I hit gold with those two. Ditto what Monika & Sam said!! 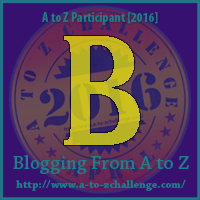 Hi, I dropped by from the A to Z. I’m visiting the dog sites today because dogs make me happy! Your post is great advice, regardless of the breed you seek. I love your page. Wishing you fun and success through the challenge. Thanks so much Scarlett. I must stop by “Frankly Scarlett” today and visit. Please feel free to hop on over anytime, we love the company. Have a great week! Oh my goodness, just look at the chubby baby, he’s just adorable!!! Adorable now too but as a puppy, my goodness. We know all too well in my family about puppy mills. One of my mom’s s from a puppy mill and she has one rescue as well. I think having siblings and litter mates are truly special. The best I’ve got is Leo and Jaxson came from the same breeder. LOL I’m so happy Harley’s breeder is behind bars – he was awful.